Marshall, Tabitha. "Battle of the Plains of Abraham". The Canadian Encyclopedia, 10 September 2018, Historica Canada. https://www.thecanadianencyclopedia.ca/en/article/battle-of-the-plains-of-abraham. Accessed 20 April 2019. The Battle of the Plains of Abraham (13 September 1759), also known as the Battle of Quebec, was a pivotal moment in the Seven Years’ War and in the history of Canada. A British invasion force led by General James Wolfe defeated French troops under the Marquis de Montcalm, leading to the surrender of Quebec to the British. Both commanding officers died from wounds sustained during the battle. The French never recaptured Quebec and effectively lost control of New France in 1760. At the end of the war in 1763 France surrendered many of its colonial possessions — including Canada — to the British. Published by Laurie and Whittle, 1759 this engraving shows the three stages of the Battle of the Plains of Abraham: the British disembarking, scaling the cliff and the battle. The battle was a key moment in the Seven Years’ War (1756–63), which was fought in Europe, India and North America (American history books refer to the conflict in North America as the French and Indian War). On one side was the alliance of France, Austria, Sweden, Saxony, Russia and Spain; on the other, the alliance of Britain, Prussia and Hanover. While France was preoccupied by the hostilities in Europe, Britain targeted French colonies overseas and attacked the French navy and merchant fleet, in the hope of destroying France as a commercial rival. Although the French repulsed several British attacks in North America — including the successful defence of Fort Carillon by Montcalm — the British had made significant gains by 1759. On 26 July 1758, they captured the fortress of Louisbourg on Île Royale (Cape Breton Island), which led to the seizure of other French positions in Atlantic Canada, and left New France exposed to British ships, which could now sail up the St. Lawrence River. One of the brigadiers of the Louisbourg expedition was James Wolfe, who was praised in Britain and its American colonies for his role in taking the fortress. James Wolfe, supported by a naval force under Vice-Admiral Charles Saunders, was appointed commanding officer of the British assault against the fortress city of Quebec in 1759. 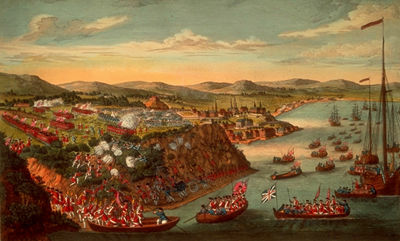 On 27 June 1759, Wolfe and his men landed on the Île d’Orléans; by the middle of July, the British also occupied positions on the southern bank of the St. Lawrence River at Point Lévis (directly across from Quebec), and on the northern shore about 13 km from the city, close to the Montmorency Falls and a French army encampment at Beauport. However, the French forces at Beauport were protected by the Montmorency River, and any attempts against the city of Quebec would have to face the fort’s battery of guns as well as the strong currents of the St. Lawrence. The French would be difficult to dislodge. The British attacked the French position at Beauport on 31 July but were met by fierce resistance and had to retreat. At this point, Wolfe sent Brigadier James Murray to target French stores and shipping about 65 km upriver from Quebec. While this reduced the supplies available to the French defenders, it did not lure Montcalm into open battle. In desperation, Wolfe resorted to the systematic destruction of the buildings and countryside around Quebec, but Montcalm still refused to attack. However, in late August several British ships managed to navigate the difficult currents of the St. Lawrence River and sail past the Quebec batteries, establishing a strong British naval presence upriver of the city. The British command therefore decided to try landing an invasion force upriver from Quebec, cutting the city off from Montreal and forcing Montcalm and the French army to fight. James Wolfe decided to land at L’Anse-au-Foulon, about 3 km upstream from Quebec City, at the base of a cliff 53 m high. While historians have debated the logic and merits of this decision, the British were fortunate, as the area was only lightly defended. Operating in darkness and silence, the naval boats fought the strong currents of the St. Lawrence and landed the advance force at just after 4 a.m. on 13 September 1759. A British force of light infantrymen led by Colonel William Howe (who would later command British forces during the American Revolution) scrambled up the cliff and subdued the French picket (advance guard). By the time the sun rose, Wolfe and the first division were on the plateau, and by 8 a.m. the entire force of 4,500 men had assembled. The British force stretched across the Plains of Abraham (named for 17th-century fisherman Abraham Martin) in a shallow horseshoe formation about 1 km long and two ranks deep. Wolfe leading his army during the Battle of the Plains of Abraham. When Montcalm heard about the British landing and ascent, he decided to attack quickly before the British had the chance to establish themselves. Historians have criticized his response, suggesting that he should have waited for reinforcements to arrive from French detachments in the area. The French force consisted of about 4,500 men from the army at Beauport, many of whom were militia or Indigenous warriors (see Indigenous-French Relations). Wolfe’s army was very close in size, but was composed almost entirely of regular soldiers, highly disciplined and trained for the field battle to come. Indigenous allied nations living on the réductions, or reserves, of New France were referred to as the Seven (or Nine) Fires, or Seven Nations, depending on the period and circumstances. The seven nations were located at Lorette, Wolinak, Odanak, Kahnawake, Kanesetake, Akwesasne and La Présentation (see Abenaki, Algonquin, Haudenosaunee, Wendat). The Seven Nations participated as allies of the French in the early campaigns of the Seven Years’ War. Indigenous marksmen were positioned with Canadian militiamen in the bushes along the British flanks. According to one British soldier’s account, “The enemy lined the bushes in their front, with 1500 Indians and Canadians, and I dare say had placed most of their best marksmen there, who kept up a very galling, though irregular, fire upon our whole line.” Historian Peter Macleod has noted that some of the first shots fired during the battle were fired by Indigenous marksmen. 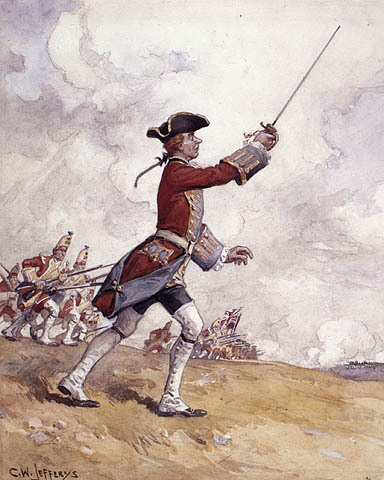 Montcalm leading his troops on the Plains of Abraham. Montcalm’s men advanced and began firing once they were about 120 m from the British line. However, Wolfe’s soldiers stood firm until the French were about 40 m away, when they started the rolling volleys which quickly halted and then reversed their enemy’s advance. General Wolfe died soon after the firing commenced, shot three times in the first few minutes of the engagement. After hearing that the French force was retreating, Wolfe reportedly stated, “Now, God be praised, I will die in peace.” Several other high-ranking British officers were killed as well, and the British charge lost some of its direction. 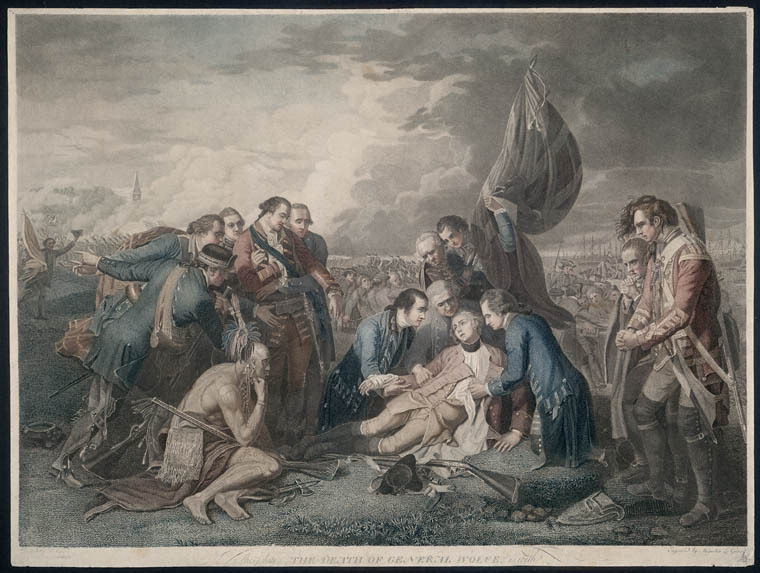 This image depicts distraught Grenadiers standing and kneeling by the side of a fallen General Wolfe at the Plains of Abraham, Quebec. The on-going combat can be seen in the background. 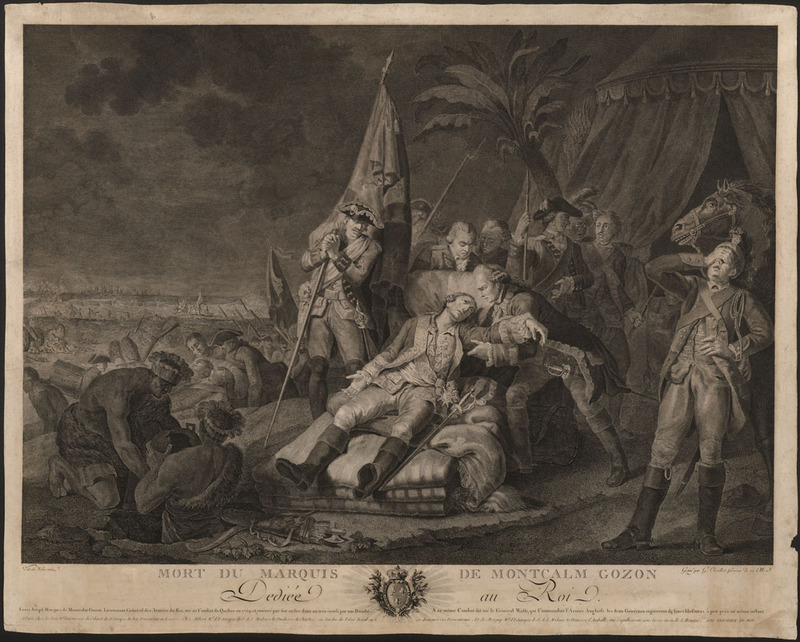 Men run to the side of a fallen General Montcalm, clearly distraught. The battle continues in the background. Townshend’s decision to entrench the British position instead of aggressively pursuing the French army had significant consequences; the French marched that night and bypassed their enemy on the way to Pointe-aux-Trembles, leaving only a small force in the town. The British laid siege to Quebec, and on 18 September, the French commander signed the Articles of Capitulation and turned the city over to the British. However, the war for New France	would continue. The British position at Quebec was not secure. Soon after the Battle of the Plains of Abraham, the British navy was forced to leave the St. Lawrence River before ice closed the mouth of the river. The British at Quebec were therefore isolated over the winter, and many suffered from scurvy. 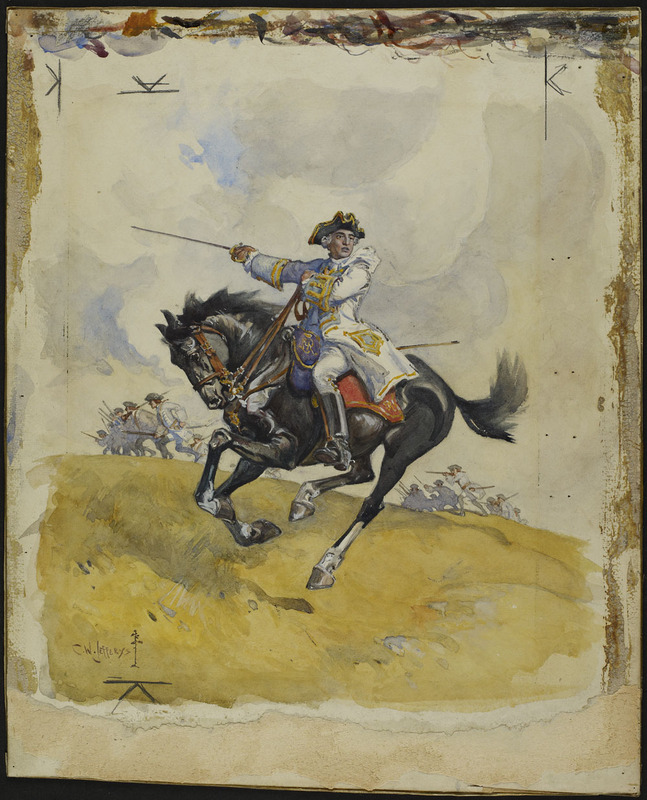 In April 1760, the Chevalier de Lévis ( Montcalm’s successor) marched about 7,000 troops to Quebec, outnumbering the defending British by about 3,000 men. On 28 April, Lévis’s force defeated the British at the Battle of Sainte-Foy, just west of the city. In a reversal of events from the previous year, the British retreated to Quebec, and the French laid siege. However, in mid-May the British navy returned, and Lévis retreated to Montreal. On 20 November 1759, the French fleet was destroyed at the battle at Quiberon Bay, just off the French coast; there would be no reinforcements for New France. On 8 September 1760, Montreal surrendered to the British and with the 1763 Treaty of Paris, New France was officially ceded to Britain (see Province of Quebec 1763–81). The Battle of the Plains of Abraham marked a turning point in the history of New France and what would eventually become Canada. By defeating and securing the French stronghold at Quebec, the British established a strong presence in New France, foreshadowing the eventual defeat of the French and the beginning of British hegemony in North America (see Conquest). However, the removal of France as a North American power increased the confidence of British colonies such as New York, Pennsylvania and Massachusetts, which subsequently agitated for greater independence from Great Britain. The Battle of the Plains of Abraham therefore led not only to the British control of Canada, but also indirectly to the American Revolution, the creation of the United States and the migration of Loyalists northwards (see also British North America). The British victory at Quebec in 1759 (and in the Seven Years’ War more generally) had a long legacy, affecting the borders, culture and identity of Canada. 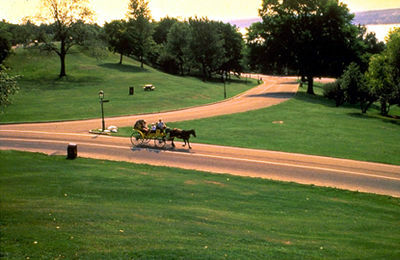 The site of the famous battle between Wolfe and Montcalm is now a park near the Quebec Citadel (photo by Michel Gagnon/CUQ Communications). Fred Anderson, Crucible of War: The Seven Years’ War and the Fate of Empire in British North America, 1754–1766 (2000). Stephen Brumwell, Paths of Glory: The Life and Death of General James Wolfe (2006). D. Peter MacLeod, Northern Armageddon: The Battle of the Plains of Abraham (2008). C.P. Stacey and Donald E. Graves, Quebec, 1759: The Siege and the Battle (2002). C.P. Stacey, Quebec 1759: The Siege and the Battle (1959).